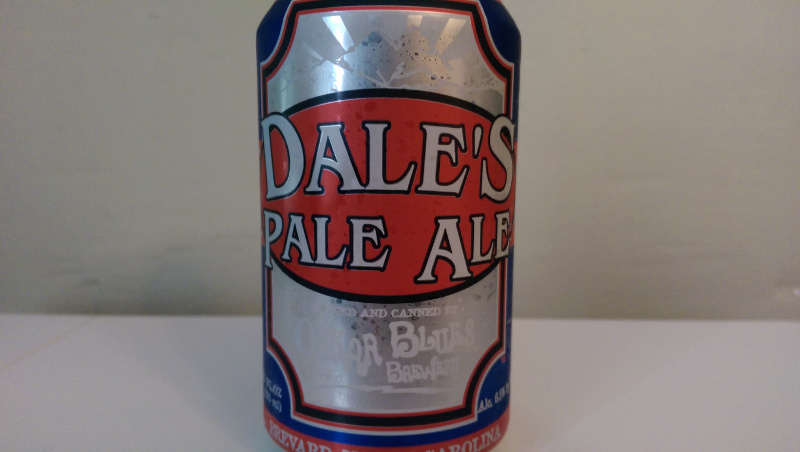 Beer Profile: Oskar Blues Dale’s Pale Ale – Food. Beer. Stuff. Oskar Blues brews only recently appeared on shelves in Delaware, so I have been excited to try them out. So far I have only been able to find Dales Pale, Old Chub and MLYP in stores but I look forward to some cans of G’Knight and Deviant Dale finding their way to Delaware soon. Also, I am very excited to try out their seasonal triple digit IBU, Gubna IPA, which was just tapped yesterday at one of my favorite local spots Kid Shelleens. Here’s to hoping some is still around by Friday. So in today’s Beer Profile I finish up the Oskar Blues sampler pack with the previously mentioned Dale’s Pale Ale. 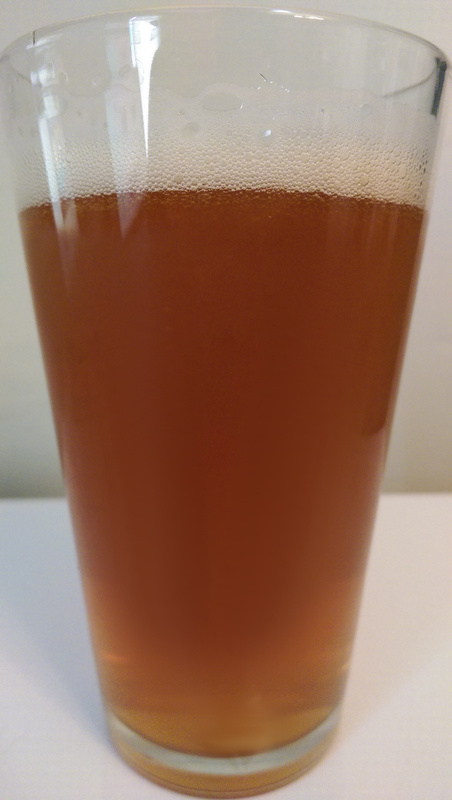 Dales Pale Ale pours an easy two finger head on top of a copper colored opaque glass of beer. The visual is quite inviting, as I bring to the nose I pick up some heavy citrus and floral hops scents with just a touch bread. I finish smelling the beer (and as I write this I imagine just how silly I look doing so) and waste no time taking a nice large sip. From the smell, one might of guessed this was actually an IPA but my mouth betrays my nose and this is actually much more sweet and savory then bitter. The bitter is there, for sure but I find Dales Pale Ale has a very nice balance right off the bat. 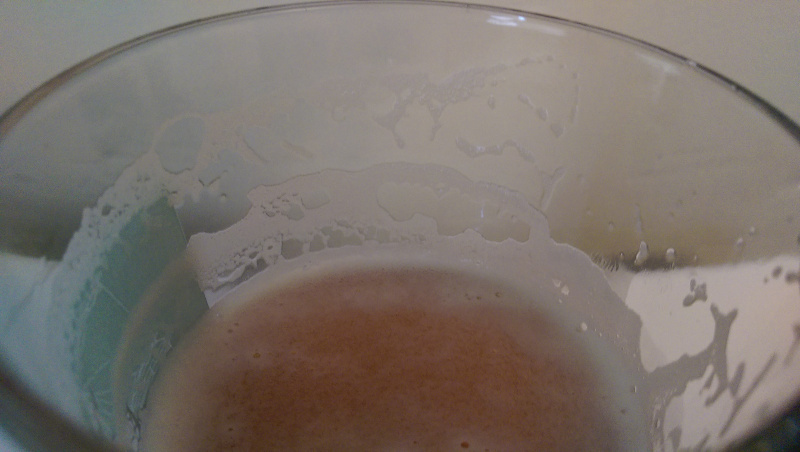 Here is the traditional beer profile lacing shot. As I continue to imbibe, I notice just how heavy of a pale ale this is. Though nowhere near as heavy as say, the Old Chub Scotch Ale, for a pale ale, I would say this has been one of the heavier mouth feels I have come across. Where most pale ale will be on the medium side of light, this is on the heavy side of medium (did that make sense?). Far from a negative, I find it quite agreeable to the palate. The carbonation is right on the money, though a bit high in general, I find it balances out the weight nicely. Oskar Blues Brewery is now 3 for 3 with me. I found Dales Pale Ale to be an exceptional example of the style. Though heavier than most and a bit less bitter than most this doesn’t detract from the experience, rather I find this a welcome wrench in the gears of the everyday pale ale, giving Dales Pale Ale some real character. 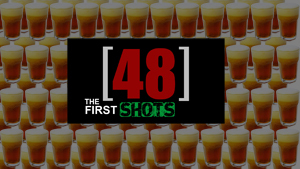 Like the Old Chub and MLYP I tried before, I give my full and enthusiastic endorsement. Go out and buy a case, you won’t be disappointed. Have you tried Oskar Blues Dale’s Pale Ale? What are your thoughts? Lets talk about it in the comments below.